Dont worry, I’m not going to tell you to go for a run or meditate or eat more vegetables – I wouldn’t do that to you! Here’s some alternative creativity boosts that work a treat for me. Recently I reviewed 5 alternative todo lists, from using elastic bands to framing your list. Since then, I’ve gone a little bit crazy for productivity apps and tips. So, here’s five shiny, new discoveries of how to keep organised. I owe the discovery of most of these to the wonderful Reddit productivity community – thank you! I recommend joining their network for daily advice and inspiration. Most motivated people seem to have an ongoing ‘to-do list’. It’s usually about five years old, scrunched up in your bag and has more scribbles on it than a colouring book. Although that looks like a clear sign of a ‘go-getting’, motivated person, whether anything gets done on that list is another matter. If, like me, your old-school ‘to-do list’ needs a bit of an upgrade, read on for a few ideas. When we did all become so obsessed with lists? I was a rather anxious child (I still am really, both anxious and childish) and I couldn’t get to sleep. My mum said I should write the things I was worried about on a piece of paper, fold it up and then rip the paper into bits. I guess this was meant to symbolise ‘forgetting your troubles’ or at least showing your troubles who the boss is. So, I wrote down what I was worried about, folded the piece of paper up and, instead of ripping it up, I put it on my side table. ‘Great!’ I thought ‘Now I don’t have to worry about forgetting all the important things that I need to worry about.’ Little did I know, in this moment was born my first unintentional ‘to do’ list. From what I can see, lists are in fashion. Every article I read at the moment is ’23 ways to dye your mustache hair’ or ‘101 reasons to join a nunnery’ or ’41 signs you’re psychic’, etc. It’s as if we see them and think ‘Huh, I can only think of 10 signs, I wonder what the other 31 are…’ This unusual fad of cataloging anything and everything seems to reel in the readers though. Being an avid consumer of other peoples lists myself, I’ve decided this must be my time to shine! So here’s my first list… about lists. ‘5 reasons I love lists’. You can’t fix all the broken things in your flat if you’re busy writing a list of all the things that need fixing in the flat… I mean, you only have on pair of hands. One thing at a time! Not sure if you want to be with your boyfriend/girlfriend anymore? Pro’s and Con’s list! Deciding whether to quit your job? Pro’s and Con’s list! Not sure if you want ham or cheese in your sandwich? Pro’s and Con’s list! For those of you who are spontaneous you may wonder why this is a positive thing. Well, people who write lists do not like spontaneity! We like order, structure and planning. Lots of planning. So, when one of you free-spirited folk come up with a really superb, unexpected idea like ‘Hey! Want to go to a roller disco in an abandoned warehouse full of cockroaches and questionable substances on the wall, like, RIGHT NOW! ?’ then alarm bells ring in our heads. However, fear not, we will write a list about how we intend to go about this impromptu activity to calm ourselves down. Once we’ve written a list about it, it’s suddenly not so spontaneous and we feel bit less panicked and sweaty. Need an excuse to leave somewhere you don’t want to be? 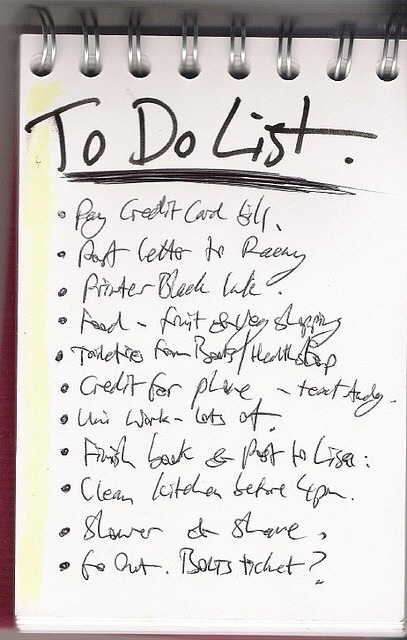 There’s no feeling like looking at a completed ‘to do’ list. Lines neatly drawn through every item and no chores left in sight. It’s utter bliss.